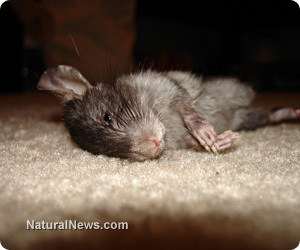 (NaturalNews) Enough MSG will destroy your vital organs. A study conducted by the Lab for Development-Aging, Neurodegenerative Diseases (Lab de Desarrollo-Envejecimiento, Enfermedades Neurodegenerativas) in Guadalajara, Mexico, found that high concentrations of monosodium glutamate (MSG) in the central nervous system caused neural necrosis - or premature cell death - severely impacting the neuroendocrine system, as well as blood flow and organ functions. Based at the Centro de Investigacion Biomedica de Occidente, IMSS, the researchers injected laboratory rats with high doses of MSG, which bypassed the blood-brain barrier and induced severe kidney and liver damage. In this process, the neurons of the brain are literally overstimulated to the point of death through a process that science terms "excitotoxicity." These large, toxic doses of a chemical additive commonly used in foods transferred high rates of the enzymes alanine aminotransferase (ALT) and aspartate aminotransferase (AST), as well as lipid peroxidation, which unleashes free radical cell damage, into the liver and kidney of the rodents, delivering degenerative doses within 30-45 minutes. Further, the organs showed enlargement (edema) and basic toxicity within 15 minutes of injections. At lower levels, people of the world in general and Americans in particular are eating monosodium glutamate on a daily basis in hundreds of food items. Cleverly and deceptively disguised on labels under literally dozens of trade names - such as "natural flavor," "yeast extract," "hydrolyzed vegetable protein," "textured protein," and "natural meat tenderizer," - MSG is known for triggering headaches and hypertension, fueling obesity and damaging the endocrine system and central nervous system. In functionality, MSG excites the brain, giving taste buds the sensation of satisfying nutrition while producing serious cravings. This is why food companies love spiking their products with MSG - it is, frankly, addictive. The salt attached to free glutamic acid (an amino acid protein) triggers an insulin spike that creates an out of control appetite, making almost anyone inclined to overeat. This is because the body doesn't have to break down the free form of glutamate, and it is very rapidly absorbed. •Meats, particularly those marinated or preseasoned, many types of lunch meats, hotdogs etc. Further, diet drinks and other products that contain aspartame also serve as "excitotoxins" and can wreck the same devastation on your body. Worse, MSG is now commonly used as a major additive in vaccines, along with other dangerous ingredients, including thimerosol (mercury), aluminum, formaldehyde, fetal bovine serum, polysorbate 80 and more. It also shows up under sometimes hidden names on vaccine ingredients (including "amino acids" "L-monosodium glutamate" and "hydrolyzed gelatin") supposedly to preserve and "stabilize" the attenuated virus and maintain its effectiveness.